I almost forgot to share the ornaments I made for my boys this year! 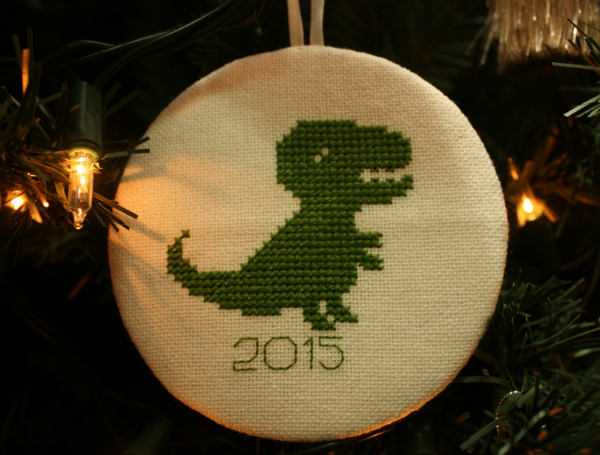 Every year I make each of them a new cross-stitched ornament that reflects their interests that year. This year Nathan has discovered dinosaurs. He's never been a big reader, but suddenly he's reading books with huge words like Pachycephalosaurus and Ichthyosaurus. It has been fun to see him so fascinated by something new. I purchased this cute dino pattern from AndWabisabi on Etsy. Last summer Zachary found a junior bow and arrow set when we were in a store and decided to buy it. Turns out he, Paul and I all really enjoy target shooting. Before long, Paul bought a bow for himself and I just got a bow for Christmas. Zachary will be getting a better quality bow for his birthday in February, so once spring comes we'll be able to practice together. I found this pattern on Pinterest, but unfortunately the link didn't go anywhere and there were no identifying marks on the picture so I can't give credit to the designer. Aiden has been our drummer for a few years now, but this year he decided he wanted to learn guitar too. He has spent a lot of time in his room practicing and used the money from his once-a-week paper route to buy a used electric guitar and amp shortly before Christmas. This pattern came from the book Donna Kooler's 555 Country Cross-Stitch Patterns, which I've had for a long time. 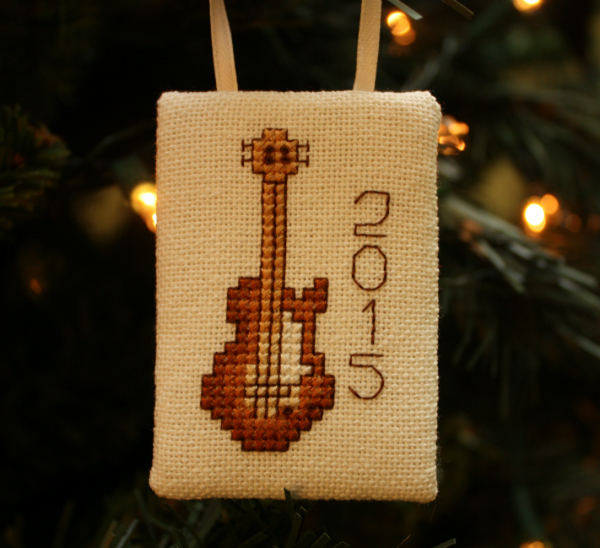 I've used a couple of the designs for ornaments, including Aiden's drum set in 2013. I always hang the ornaments on the tree on Christmas Eve for the boys to find in the morning. This year they went to find their ornaments before their big performance to wake us up. I love how interested they are in the ornaments. I don't know if I'll be able to let them take theirs when they're old enough to move out, though...there are so many of them on our tree that the tree would look naked without them! What a great idea. They are beautiful. These are lovely Leanne, what a nice idea. These are so awesome. 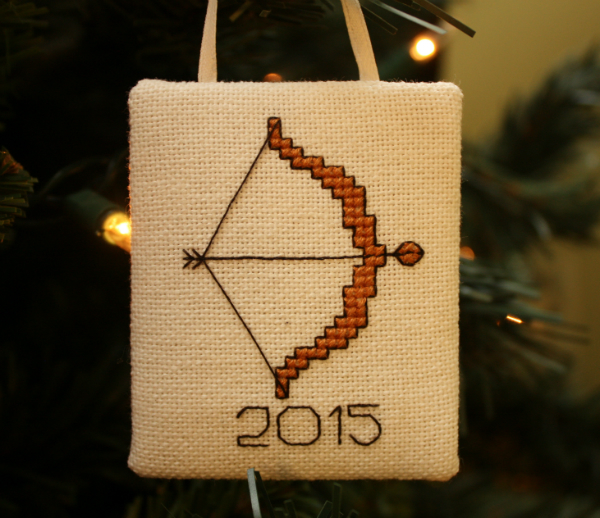 I used to make a new ornament every year for kids and then grandkids. Some of my favorite ornaments incorporate photos of the kids (which hopefully are dated). I really love putting up the tree so I can look at all the handmade ornaments...45 years of collecting!! They look great! I love your tradition.